As the influence of analytics has spread across basketball, the style of play and overall aesthetic of the sport have evolved. As teams like the Golden State Warriors and Houston Rockets have embraced a pace-and-space, penetrate-and-kick offensive philosophy, basketball scoring has been cleaved into two categories: interior buckets within the paint (i.e. Giannis ball) or relentless three-point shooting (i.e. Curry ball). First, we looked into two basic metrics that are found on most box scores: three-pointers attempted per game (3PA) and three-point percentage (3P%). Compiling individual game statistics dating back to the 2009-10 season, we found the average 3PA and 3P% of each season up to the most recent Jan. 26 Dartmouth contest. Below is a graph on Harvard’s average three-pointers attempted per game by season. What is most notable here is the precipitous decline up to 2014-2015, followed by an drastic spike to a 23-plus level that has persisted to the present. Although its three-point attempts have remained relatively stable in the past three seasons, this new rate is significantly higher than the beginning of the decade, with about 5-6 more threes attempted per game. Although the number of three-point attempts has risen in the past three seasons, shooting accuracy has not. The Crimson shot at a 40.1 percent clip in the 2012-2013 season, its highest in our measured range, but has since flattened to around the 35-36 percent range. That plateauing coincides in some way with a changing of guard, as the current highly-touted crop of juniors (including four ESPN Top 100s) first entered the team in 2016-2017. Next, we took total three-point attempts each season and divided that number by total field goal attempts. In essence, this was the percentage of shots that came in the form of a three-point attempt. Again, comparing from around 2014 to the present season, there is a statistically significant increase in the fraction of field goals that ended in a three-point attempt. Although the results show a marginally declining increase, the Crimson is still nevertheless showing a more aggressive season-by-season effort to take triples. This year’s current ratio is the highest in recent history at 42.6 percent. Compared to past renditions of the Harvard side (particularly pre-2016), this is a remarkably high ratio. 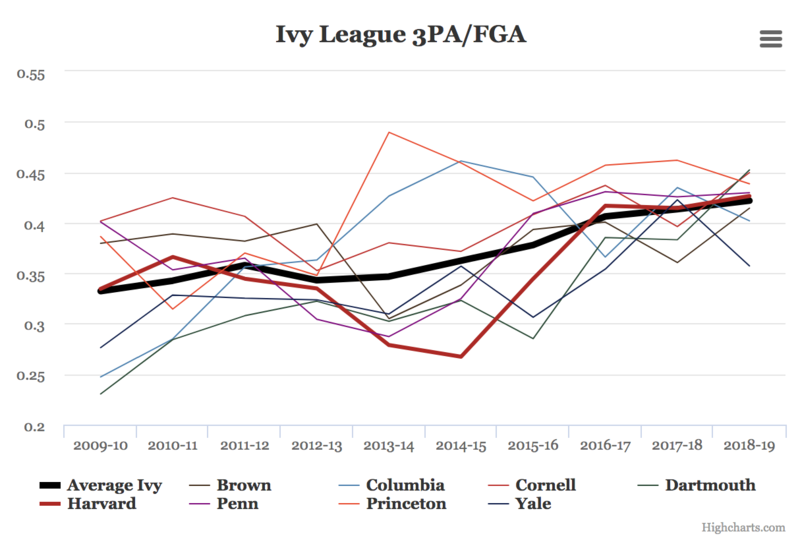 Finally, we did the same calculations for the remaining seven Ivy League teams and found that the Ivy average in 3PA/FGA has also seen a significant spike since the start of the decade. Currently in 2018-2019, the Ancient Eight on average attempts 42.18 three-point shots for every 100 field goal attempts, slightly below Harvard’s numbers. Princeton has recently led the pack in this category, achieving its highest three point to field goal attempt ratio in recent history — a resounding 48.95 percent — in the 2013-14 season. Penn and Cornell, who saw coaching changes in 2015 and 2016 respectively, have also stayed mostly above the mean in recent years. Dartmouth, who this year has one of the nation’s leading three-point shooting units led by Brendan Barry — NCAA’s most accurate shooter from deep — unsurprisingly pace the Ivies at 45.22 percent 3PA/FGA this season. What does the Crimson think about its three-point shooting? Harkening back to the reference to the Warriors, the Harvard team had a once-in-a-lifetime experience this past Sunday. Following a win over the Boston Celtics the prior night, Golden State decided to hold a practice inside Lavietes Pavilion, and Harvard’s student-athletes were invited to watch Stephen Curry, Kevin Durant, Klay Thompson, and more take shots underneath its own roof. Previously, Harvard had hosted the Sixers and Duke Basketball this past season. Coach Tommy Amaker, who had actually been teammates with Warriors head coach Steve Kerr on the gold-medal 1986 World Championship team, joked with his compatriot that he had “messed up the world of basketball” with the Warriors' relentless ability to drain triples. “I said everybody wants to play like you guys, but no one has the players that you have,” Amaker added. However, the Harvard coach did acknowledge his team’s embracing of several core principles that has spurred the Warriors to three titles in the past four seasons. For Harvard players, the explanation of the team’s record frequency of three-point shooting brought more surprise than affirmation, particularly in lieu of the Crimson seemingly depending on junior big Chris Lewis’ “inside-out” presence and Ivy-leading field goal efficiency numbers. “I don’t know if that’s because of the game and how it is evolving in general, but that’s nothing that has been intentional as far as jacking up threes,” junior guard Christian Juzang added. Regardless, there is little argument that the triple will continue to be a lethal weapon for the team as opportunities will abound for wings such as junior Justin Bassey and first-year Noah Kirkwood as well as stretch fours including sophomore Danilo Djuricic and Baker, among other targets. As this season progresses into the depths of the Ivy League campaign, expect the emphasis on three-point shooting to continue to play a significant factor in influencing wins and losses. Looking ahead, it will be intriguing to see whether these upward trends from long range continue to persist in both the professional game and in the Ivy League. — Staff writer Michael Xie can be reached at michael.xie@thecrimson.com. Follow him on Twitter @MichaelEXie1.